January | 2012 | Elger's Weblog! I just came across a nice wordpress plugin that makes site-headers look absolutely gorgeous. So, using my Photoshop skills and general knowledge on web development, i made one for Hack42. It came out fantastic! With special tooling, that comes with the commercial version of the plugin, the slideshow was created. The tooling allows to choose what images to use, what titles and subtitles, the delay, styles and some other minor things. In the end it delivers a .zip file that can be uploaded to the site. Now to actually make a header… things get creative and innovative. With some careful engineering and code manipulation tricks i actually got the header where i wanted it to be: the header. It required edits in the style.css and header.php files, as well as a dummy page for some workarounds. One problem occurred: the site header is 200 pixels high, while wordpress insisted it should be 170 pixels. Somewhere, buried deep down in wordpress this was specified. I’ve looked everywhere but nowhere to find why or when 170 pixels high was defined. Time to move in the heavy artillery. If you know something on coding, you might want to get a bucket or two to vomit. Basically i change any value of “170” with “200” on a large portion of the site. This is the wrong way to do things. Who cares about all the grunt work. We all want to see nice images and flashy headers. That’s what counts and that’s what we’ve accomplished with all this work. It looks awesome and professional. And that’s just the way i like things. PS this website will soon also feature these great professional headers with images of my life. This entry was posted in Coding, Hack42, Marketing and tagged hack, Hack42, header, innovation, mad on January 30, 2012 by elger. Today I stumbled upon an audio file from HAR FM. This was the radio studio on Hackers At Random, the large hacker-camp in the Netherlands in 2009. At that time, i just started DJ-ing. At home i had two technics SL D2 turntables, bought for about three (3) euro. These tables are direct drive and have a stable platter. I also started using FinalScratch, which is a digital-vinyl solution. On HAR2009, both 2600(de) and HARFM had some turntables up and running. This was the first time i could work with real turntables, and well: actually mix things for real! My first attempt was at the 2600 dj booth. They brought great german breakbeat music. Unfortunately i still don’t know the specific genre. DJ Ubik was about to play that night, but he was stoned and zoned out. So Psychic and me proposed we would do a back to back session. This has been one of the most awesome experiences ever. Ubik brought his Drum & Bass collection, a selection of very fine niche selection of Drum & Bass. He did the record selection and together we did our extreme best to mix everything together. Thanks to the HAR FM team for recording the show and the amazing broadcast facilities. Download the Drum & Bass mix here: *click*. This entry was posted in Memoires, Mixing on January 22, 2012 by elger. 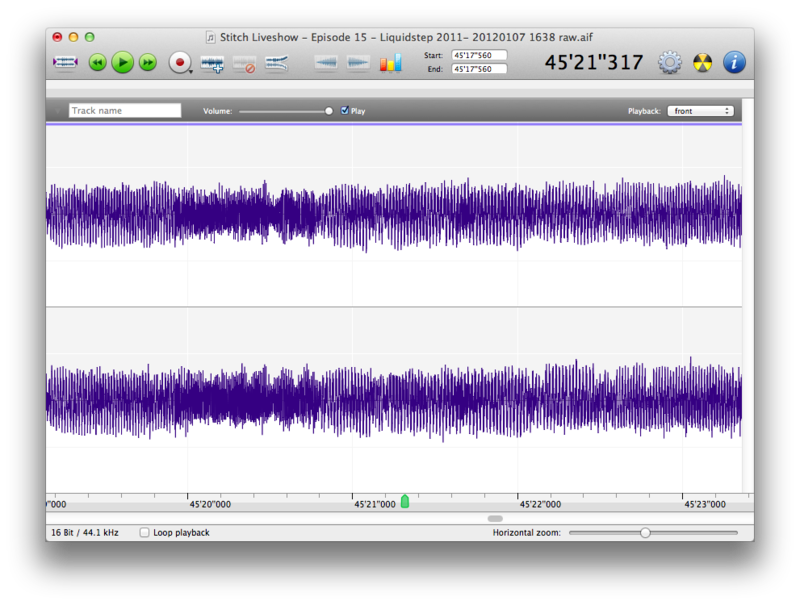 Today i made a tryout of a charts-show with music that is free to use in non-commercial productions. The tryout features 15 tracks in one hour, counting down from 15 to one. It includes various musical genres like rock, house and ambient. My personal favorite is Zero Project – The Secret Passion, track number 8 in the show. This entry was posted in Music on January 20, 2012 by elger. Start the new year fresh with a selection of the best “liquidstep” (dubstep) from 2011 mixed harmoniously. Even though my gear didn’t really comply to my bidding, I managed to cram 35 songs in 70 minutes. Using digital vinyl mixing, this is a nice speed, especially when you’ve never mixed these tracks before. The most difficult thing on mixing liquidstep are the overflowing melodies: mixing them in key requires some software tricks. I prefer avoiding trickery, in this case its the most feasible alternative though. 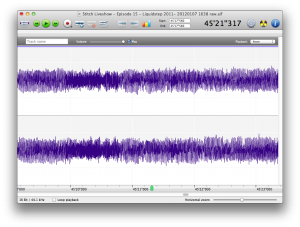 The picture on the right shows recorded audio. Later this year it’s time to change gear. Vinyl mixing has been great. I wanted to learn how DJ’s mixed together their songs back in the days. Using turntables and a mixer teaches you the basics the hard way: no sync button, having to do with the various discs and mastering on them. I want to start focussing on digital mixing: i expect a boost in creativity and using things such as queue points, syncing and more use of filters and effects. Vinyl mixing still will be important to me, for example when playing early house tracks. To me, digital mixing gives a new dimension. Enjoy this 70-minutes digital-vinyl-mixed liveshow! Filesize: 162.6 MB, 320 kbit. This entry was posted in Mixing, Music on January 7, 2012 by elger. At Bit & Nieuw we launched 2012 mini-rockets from an old oil drum. Following the instructions on the label, we did exactly what was told: place it in a container [X], use a certified lighter [X] and keep your distance [X]. 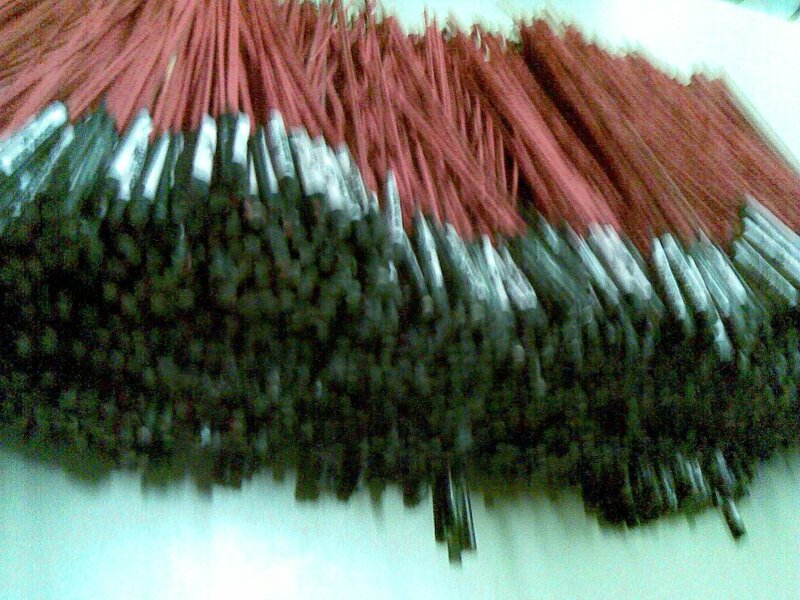 Result: a massacre and guaranteed much less safe than regular fireworks (so more awesome). 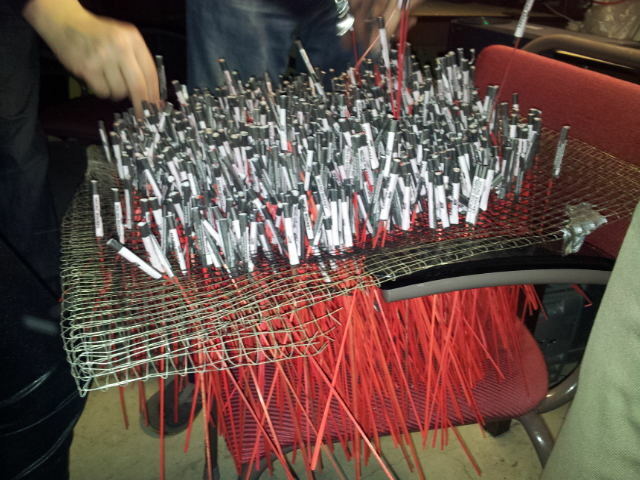 This entry was posted in Fun, Hackerspaces and tagged Ackspace, admin, Bitlair, enzo, New year, runs, stunt, vuurwerk on January 4, 2012 by elger. 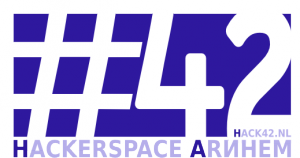 Hackerspace Hack42 looks back at 2011. As one of the founders it’s great to see such prosperity. The future for Hack42 looks very bright. Due to their move to KKN6 it has become one of the largest hackerspaces in Europe in terms of space. In the past year there have been over 50 activities and many projects. Will these numbers increase this year? I hope so! The complete text is on hack42.nl (in dutch). This entry was posted in Hack42, Lifestyle and tagged Hack42 on January 2, 2012 by elger.